Although the rainy season has ended, my obsession with makgeolli (Korean rice wine) has only become stronger. It has consumed my thoughts, really, and I've found myself on a constant search for the best flavors and makgeolli bars throughout the city. 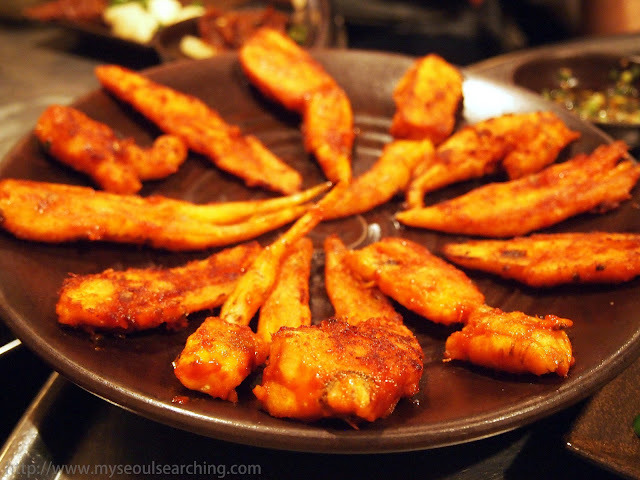 I started to think that maybe I was the only one out there with this somewhat unhealthy infatuation, but when I came across the Makgeolli Mamas and Papas website, I was glad to know that I wasn't alone. Makgeolli Mamas and Papas (or MMP for short) was started by Monica and Julie, two expat women living in Korea. It began about a year ago as an informal meeting of makgeolli lovers and has since developed into a more organized community. Their website strives to educate the public on Korean makgeolli culture but the real draw of MMP is the makgeolli meetup that is held every three weeks. The event is open to only 10 people on a first come, first served basis, so I was lucky to have found the website just in time and made sure to apply as soon as I could. I paid my registration fee of 10,000won which would cover the costs of the alcohol and the food. I couldn't have been more excited. The venue changes with each meeting and September 22nd's meet up was held at the Pub of the Blue Star, a makgeolli bar that is tucked away in a converted hanok on a hidden back alley of Insadong so narrow I contemplated not eating so that I would be able to get through on my way out. But, of course, that idea went out the window once I saw the anju (drinking snacks) . The first thing I noticed about Blue Star was the atmosphere. 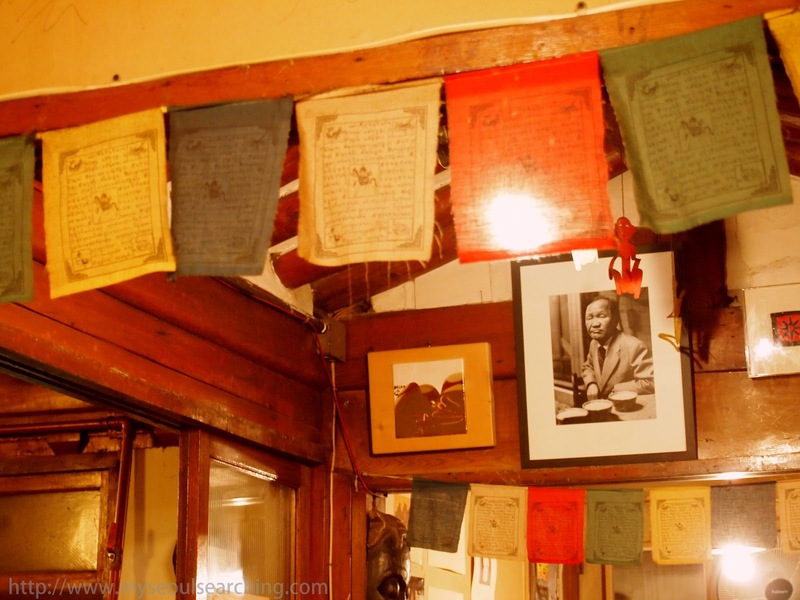 Decor included squatting buddhas, old movie posters, black and white photos of unrecognizable but friendly faces, and jars of miscellaneous roots. I also loved the colorful prayer flags that brought me back to my stay in McLeod Ganj, India, a destination that the owner also spent some time in during his few decades of travel. The hanok was rustic and the seating was cramped, which ended up being the perfect combination for creating a comfortable atmosphere amongst the "mamas and papas." Some of the mamas chatting makgeolli during the first round. 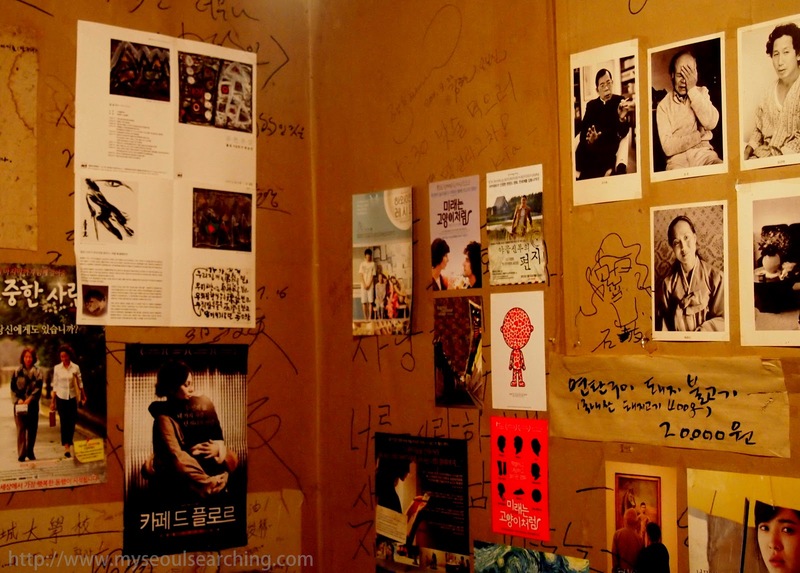 Rustic decor created the perfect ambiance for a makgeolli meet up. The prayer flags were a nice touch. I was the only newbie but didn't feel out of place, as everyone was extremely welcoming. Monica, the founder of the group, distributed the surveys we would be completing throughout the evening to rate the venue, the makgeolli, and the food. The saeng makgeolli, which is essentially standard makgeolli, was soon delivered in brass kettles. We poured the milky white goodness into each drinking bowl, Korean style. The stuff was good, distinctively different from your average convenience store bottle. We also sampled an herb variety which was sub-par, but the mugwort makgeolli, which looked like green tea, was to die for. 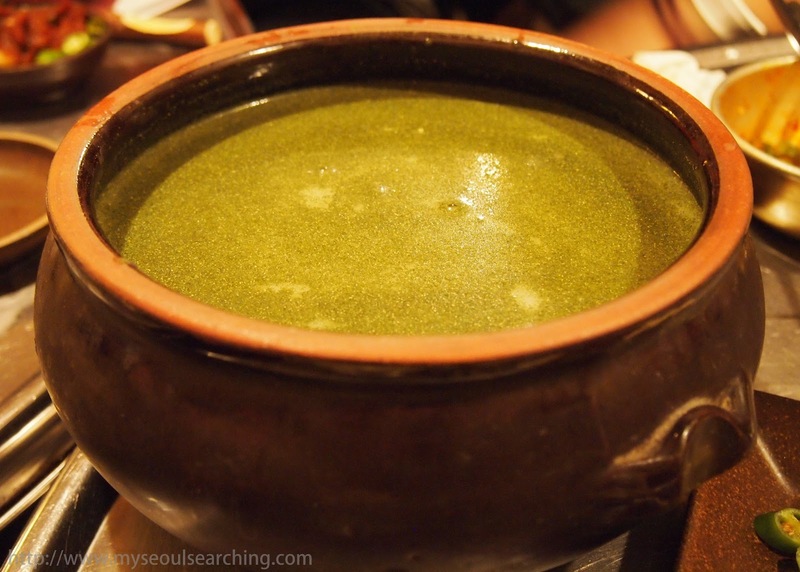 The mugwort makgeolli looked like an oversized green tea latte, but tasted a lot better. One of the makgeolli papas pours for the table. The food at Blue Star did not disappoint, either. The haemul pajeon (seafood pancake) was delicious despite the fact I'm not a huge octopus fan. The dueji bulgogi (marinated pork) was perfectly seasoned and greasy, making it an excellent drinking food. We also tried some sort of root covered with sauce whose name I forget (mostly because I was quite tipsy at the point it was brought out) but what I do remember is repeatedly thinking "Wow... this is so GOOD!" The highlight of the spread was the kimchi tobu (kimchi and tofu) which was probably the best I've ever eaten. The tofu was presented in little pyramids and practically melted in my mouth. 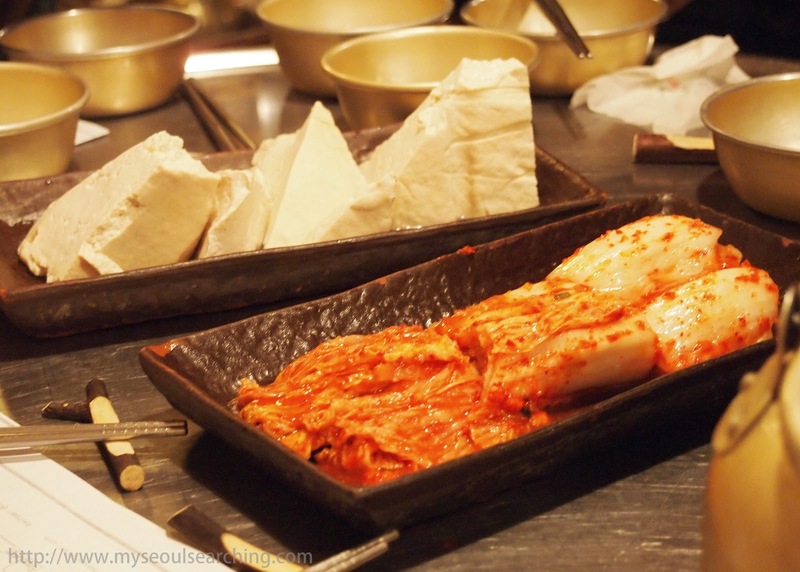 Pyramids of soft tofu and spicy kimchi were the perfect companion for the makgeolli. We ended up ordering extra servings of the phenomenal pork bulgogi. Who knew that imitation ginseng would make excellent drinking food? It was obvious we were all enjoying ourselves as the night progressed. I was enjoying myself a bit too much and ended up quite drunk, staying in the bar long after the meeting was officially over. A few others and I ordered a few more bowls of mugwort makgeolli and played drinking games until we decided to head out to Hongdae. Despite the end of the night being a blur, I had an excellent time at Blue Star with the fellow makgeolli enthusiasts. It's rare that I meet other foreigners (or even Koreans for that matter) who enjoy makgeolli so it was great meeting others passionate about the traditional alcohol. There's no doubt that I'll be joining the mamas and papas table in the future for more fun, more food, and, of course, more makgeolli. 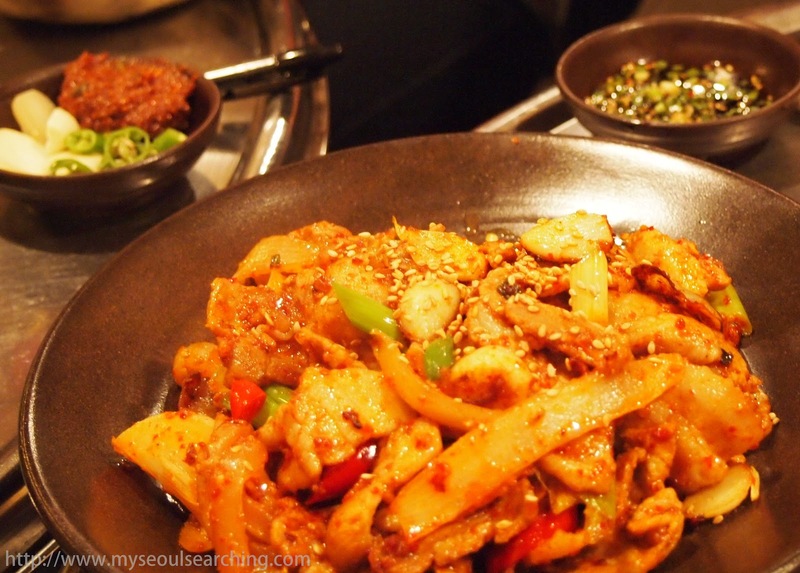 The Makgeolli Mamas and Papas meet every three weeks. 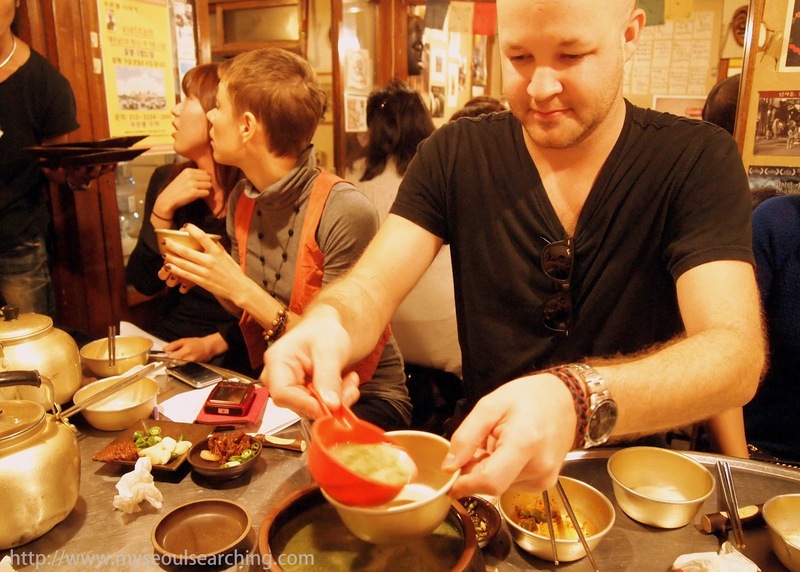 They will also be holding a makgeolli making class on October 20th, 2012. For more information, check out their website by clicking here. To get to the Pub of the Blue Star, take the subway to Anguk Station. Go out exit 6 and take the first left down the narrow alley. It will be to your right immediately after the narrow gets wider.